My son Eric and I prefer to avoid the stress that is associated with Christmas, and so we banish ourselves to the Garden Isle of Kaua'i during the Christmas holidays. Any discussion of birding in Kaua'i must begin with the Nene, or Hawai'ian goose. The official bird of the state of Hawaiʻi, the Nene is exclusively found in the wild on the islands of Maui, Kauaʻi and Hawaiʻi. The Nene evolved from the Canada Goose, which most likely migrated to the Hawaiian islands 500,000 years ago, shortly after the Hawai'ian Islands were formed. I was fortunate enough to see several groups of Nene on this trip. One highlight of our annual trip to Kaua'i is a visit to Kilauea Point National Wildlife Refuge. Kilauea Point National Wildlife Refuge was established in 1985 when the land and the historic lighthouse were transferred to the U.S. Fish and Wildlife Service from the U.S. Coast Guard. The ocean cliffs and open grassy slopes of an extinct volcano provide breeding grounds for native Hawai'ian seabirds and Nene, the endangered Hawai'ian goose.Kilauea Point gives visitors the unique opportunity to see Red-footed Boobies, Laysan Albatross and other seabirds in their natural habitat. In winter the National Marine Sanctuary waters off Kilauea are home to migrating Humpback Whales. When you arrive at Kilauea Point the first thing that you notice is the astonishing numbers of huge seabirds circling around the point. There are many Great Frigatebirds. The Red-footed Boobies are beautiful and graceful in flight, in sharp contrast to their ungainly and awkward behavior on the ground. My favorite large seabirds at Kilauea Point are the Laysan Albatross. Because it flies so fast, it is difficult for me to get a sharp photo of this bird. One of the attractions of Kilauea Point NWR is the recently restored historic Kilauea Lighthouse. The first phase of the restoration work was completed in November 2008 when the anchor bolts securing the lantern room to the concrete tower were repaired and replaced. The second phase of the restoration involved repairing the unique cast iron roof and lantern assembly and stabilizing the fragile lens. The final phase, which was finished within the past year, entailed repairs to the concrete tower, opening the closed vents and window openings, installing new windows, and removing some exterior coating to return the tower to its original appearance. We saw more seabirds on a catamaran trip to Lehua Island State Bird Sanctuary. Lehua Island is a Hawai'i State Seabird Sanctuary. As a sanctuary, many activities are prohibited on the island, but entry is not prohibited. Lehua provides habitat for at least 16 species of sea birds. … and roosting on the Lehua cliffs. Another highlight of any trip to Kaua'i is a drive up Waimea Canyon. This spectacular drive on the western part of the island goes from sea level to above 5000 feet. In addition to beautiful canyon views there are views of the spectacular Na Pali cliffs from Koke'e State Park above the canyon. Waimea Canyon is the largest canyon in the Pacific and truly a dramatic sight to behold. The canyon measures 10 miles long, 1 mile wide, and more than 3,500-feet deep. It was carved thousands of years ago by rivers and floods that flowed from the Mount Wai'ale'ale summit. The lines in the canyon walls depict different volcanic eruptions and lava flows that have occurred over the centuries. Although many of the native Hawai'ian birds can be found only by hiking into the Alaka'i Wilderness Preserve, I was fortunate to see several 'Apapane foraging in the Ohia trees. Beautiful Pacific Golden-Plover winter in the Hawai'ian Islands, and they are abundant in Waimea Canyon. There is very good birding on the golf courses in Kaua'i. I found a lovely variety of birds on several courses. These Nene were on a golf course near Koloa. There were Hawai'ian Black-necked Stilt on the same golf course. 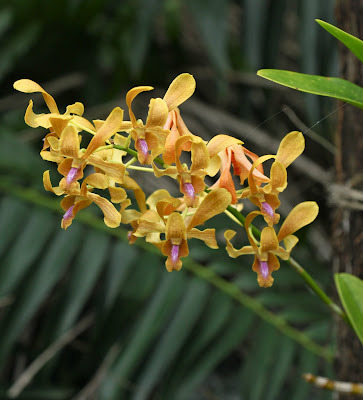 On our last day in Kaua'i we went to McBryde National Tropical Botanical Garden. There were acres of beautiful tropical flowers there. Here is a cluster of orchids growing in one of the gardens. There were also many birds in the gardens. We had another look at the White-rumped Shama and the Hawai'ian Moorhen. I would be remiss if I failed to mention the birds that are found all over the island. Common Mynas are everywhere, and are considered to be pests. Cattle Egrets are everywhere too. The pretty Spotted Doves are often found alongside the Zebra Doves. I must also give a fond nod to the Kaua'i chickens. Wherever you go on the island, the chickens are there, and they are beautiful. These were at Koke'e State Park in Waimea Canyon. These chickens were at Poi'pu Beach. Kaua'i is a wonderful place for a vacation. Although it is not generally considered to be a birding destination, I think it is a fine place for birding. I will leave you with a lovely Kaua'i sunset. All photos and videos © Linda Rockwell 2012. Email corralena@gmail.com for permission. Looks like a great trip. The color and intrigue bubbles over from under every canopy and atop every cliff in Kaua'i. I feel like I have been on vacation after reading this and viewing the images! Thanks for taking me along on your Hawaiian birding excursion. Very interesting and informative, along with stunning photos! Thanks Beverly. I will do a post on just the chickens soon. They are beautiful and varied! Linda, thank you for taking us along on your vacation to Kaua'i. It really does look like a glorioius place to visit. So many beautiful birds to see! I really enjoyed this post because the majority of the bird featured I have never seen before. Wonderful photographs, great post! It's a wonderful place to visit Julie. I see birds there that I don't see anywhere else. It's always a treat to visit and take photographs! Awesome post and photos Linda! I'm looking into going to Hawai'i (honeymoon) in the summer and a non-birder friend recommended Kaua'i for the gorgeous scenery. After reading your post, it looks like I could see some awesome birds there too! I might ask you for more info as it gets closer. Hi Jeremy. I've been to Kaua'i often enough that I am confident I can give you some great planning advice, and I'd be happy to do it. When you're ready, email me at the address in the blog, and I'll give you lots of information. I think that Kaua'i is the prettiest of all the islands. Congratulations on your upcoming marriage! OHHHhhh....Someday~will get there! Great post, photos and video! They just need to build that road so you can drive the Homey over there. You know I did not see one single RV or RV park there? Not even a small trailer! Wonderful post Linda! I was fortunate to visit Oahu in Jan '05 with my wife. We loved it there and I got to see a few really awesome birds that you have shown here. Your post really took me back to that wonderful week and makes me want to go back and explore the other islands. Great post and beautiful photos! Truly makes me want to go there and search for Hawaiian birds. Happy you enjoyed the post and photos. It's a wonderful place for vacationing and birding! Oh wow, cool series of birds and photos from Kauai! After seeing this post, I am so sorry that I was not into birding after my trips to Hawaii. Beautiful photos.